I am really happy, that there are so many breakfast treats left for the remaining TWD-recipies! They are made fast, you can easily store them for a day and bring them to work, and they are perfect for a Sunday morning breakfast. I can somehow understand that many TWDers prefer to choose more sublime, subtile recipes that challenge your baking abilities. But for me, when it comes to baking, the simple things are not the worst! 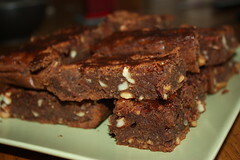 For this week, Suzy of Suzy Homemaker opted for Honey Nut Brownies. You may find the recipe on her page, or in Dorie's book on page 102. I changed the recipe only slightly by reducing the sugar, because with all the honey and chocolate, I think of them as sweet enough. For the nuts, I just used a nut mix, so I went with any nuts possible. In the end, I like them, but they might not be my all-time favourite brownies. 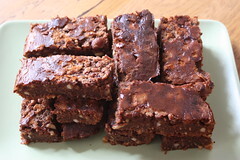 I love very moist and fudgy, almost mellow and creamy brownies, and these are more cake-like. Maybe this is because they have not so much chocolate in it, and the eggs are not seperated nor are the egg whites beaten seperately. 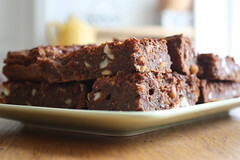 But I know there are zillions of cake-like-brownie-lovers out there, and for them this is an extremely wonderful recipe, with a decent but still remarkable honey flavour! Did you eat these for breakfast? A girl after my own heart. Glad you enjoyed them! These would be a decadent breakfast! Mine didn't bake enough so the texture was a little strange, but they were still pretty good. Not a huge fan here, either. We tried, right? :-). And they look good in the pics, too! Yum good for breakfast! They look great!! This is work in progress - I am working on becoming a home baker.